A new reagent discovered by research scientists at St George's, University of London has shown real-time brain behaviour in more detail than ever before. An ultrafast sensor which binds to glutamate will allow scientists to visualise messaging at the synapses—which occurs on a millisecond timescale. Nerve cells communicate through synapses, which pass messages from one neuron to another via small molecules such as glutamate. Although sensors have previously been developed to help scientists see this signalling, it occurs so extremely fast that even the best sensors have been unable to accurately track the process until now. The sensor, iGluu, will now be made available to other researchers who may be working on either the fundamental properties of neuronal signalling or on neurodegenerative disease such as Huntington' and Alzheimer's disease. The sensor will help reveal what goes wrong with glutamate signalling in these conditions. 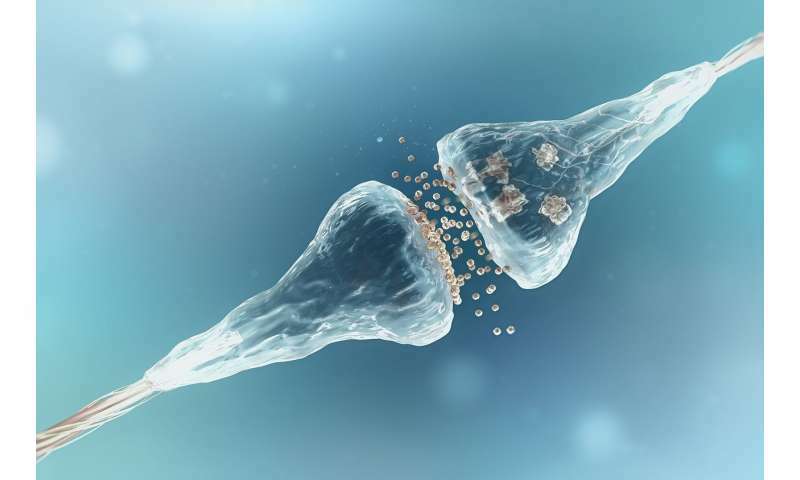 Katalin Török, Reader in Cell Biology at St George's, University of London, said: "This sensor has helped us to answer long-standing questions about the complex molecular mechanisms that occur during neuronal signalling. We can now directly demonstrate that neurotransmitter glutamate is rapidly cleared from the synapse. We now have a sensor to look at synapses in more detail than ever before, this will allow researchers to test theories about how the brain functions." The research paper has been published in PNAS, Proceedings of the National Academy of Sciences.